In addition to summarizing a data distribution as in the preceding example, you can use PROC UNIVARIATE to statistically model a distribution based on a random sample of data. The following statements create a data set named Aircraft that contains the measurements of a position deviation for a sample of 30 aircraft components. PROC UNIVARIATE uses the label associated with the variable Deviation as the vertical axis label in the probability plot. The INSET statement displays the sample mean and standard deviation on the probability plot. All four goodness-of-fit tests in Figure 4.5 reject the hypothesis that the measurements are normally distributed. Figure 4.6 shows a normal probability plot for the measurements. 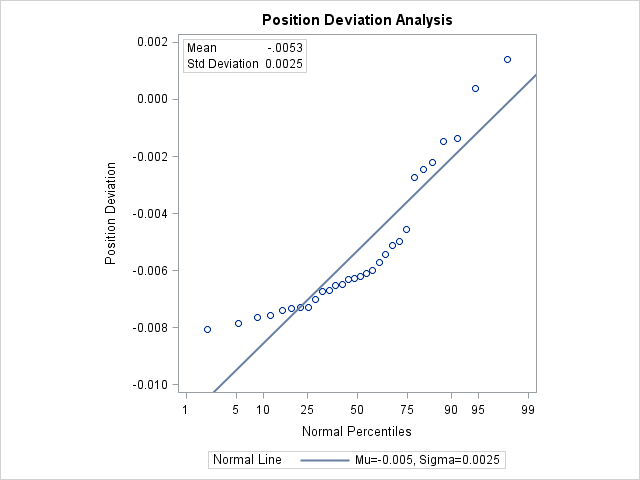 A linear pattern of points following the diagonal reference line would indicate that the measurements are normally distributed. Instead, the curved point pattern suggests that a skewed distribution, such as the lognormal, is more appropriate than the normal distribution. A lognormal distribution for Deviation is fitted in Example 4.26. A sample program for this example, univar2.sas, is available in the SAS Sample Library for Base SAS software.